Will British Pound Remain Major Convertible Currency? A shop cash register is seen with both sterling and euro currency in the till at the border town of Pettigo, Ireland, Oct. 14, 2016. 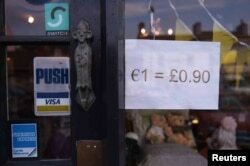 A shop indicating it's euro and sterling currency exchange rate is seen in the border town of Belleek, Northern Ireland, Oct. 14, 2016. Prime Minister Theresa May and her ministers dismiss fears about the sharp slide in the pound's value, arguing it is normal for currencies to "go up and down." 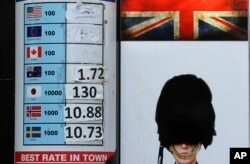 FILE - A currency exchange board with washed out rates is seen in London, Oct. 12, 2016. 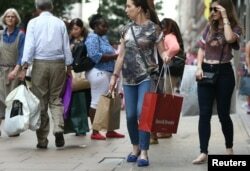 FILE - Shoppers carry bags in London, Britain, Aug. 25, 2016. The falling value of the British pound vs. other currencies is making London more attractive to bargain-hunters. John Ashcroft, an economist, businessman and visiting professor at Manchester Metropolitan University's Business School, fears "the great devaluation myth." He maintains there was no major improvement in trade after previous currency depreciations — including Wilson's 1967 devaluation, and the plunge in the value of the pound after Britain's 1992 exit from the European Exchange Rate Mechanism. Nor after the last financial crash. The Economist magazine argued this week that May and her ministers are being too complacent about the plunging value of the pound, editorializing that "recent experience suggests that British exports do not respond quickly or strongly to a cheaper currency."